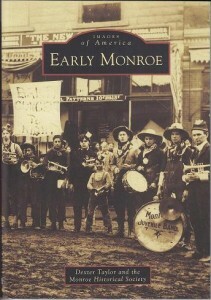 The Skykomish River initially formed a formidable barrier between the Monroe area and the valleys to the south. In 1882 Pattison’s Ferry became the first formal transportation to cross the river near the confluence of the Skykomish, Snoqualmie and Snohomish Rivers. It was followed in 1894 by a wagon bridge linking the new town of Monroe from Lewis Street to the rich farms of the Tualco Valley. And although the Great Northern Railway began providing east-west rail service to the area in 1893, no train crossed the river south until June 1911. 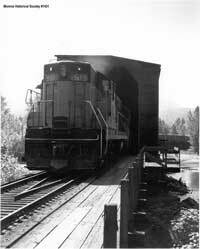 The first railroad bridge to cross the Skykomish River was built by the Everett and Cherry Valley Traction Co. Railway to provide railroad service between the Great Northern Mainline at Monroe and Tolt (now Carnation). 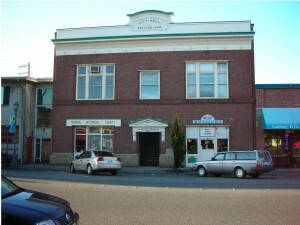 However, upon its completion in May 1911 Great Northern acquired the line and began twice-a-day rail service to Tolt in June. This line ran along the west side of Ann Street, which then ended on the river bank because the Skykomish River then flowed further north along the bed now used by Woods Creek. See the 1910 platmap. Just as Great Northern was beginning its new rail service to Tolt, the Milwaukee Road (more formally known as the Chicago, Milwaukee and Puget Sound and later as Chicago, Milwaukee, St. Paul and Pacific) completed a branch line from its junction with the main line at Cedar Falls (near North Bend) to Everett crossing the Skykomish River upstream from the Cherry Valley bridge on a 750-foot bridge using five covered Howe trusses. It then crossed the Great Northern mainline and paralleled the Great Northern on the north side. SR 2 as it runs through Monroe today runs along the old Milwaukee Road railbed for several miles. In 1917 under U. S. government control of the railroads because of WWI, Great Northern was required to sell the Cherry Valley branch line to Milwaukee Road with the right to continue service over the line. However, this service was soon discontinued and the line was later taken up. Flooding continued to be a problem for both rail lines and in September 1936, because of the high cost of maintaining bridges and trestles across the flood plains of the Skykomish and Snohomish Rivers, the Milwuakee Road abandoned their line between Monroe and Everett and began to use the Great Northern tracks instead. At first this meant that they had to use the transfer tracks in the North Kelsey area, but in 1937 they received permission to relocate their bridge across the Skykomish and their trestle across Buck Island so as to create a clean merge with the Great Northern Mainline. The new, relocated covered bridge was still the longest covered railroad bridge in the world at 450 feet. Milwaukee Road began using the new bridge and and trestle in 1939, and the following year they took up the now abandoned track between Monroe and Everett. In 1969, the covered bridge was replaced with the four steel spans that still exist. (see update below). The following year on July 4, a spectacular fire burned the trestle across Buck Island and badly scorched the bridge, but it was quickly repaired. 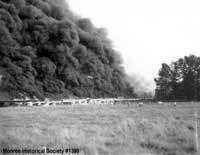 Another fire on July 22, 1946, destroyed 140 feet of the trestle between the river and Haskell Slough to the south. And on Sept. 18, 1953, a similar fire burned the trestle south of the river across Haskell Slough. In 1973 Milwaukee Road abandoned their branch line to Monroe and began using the old Northern Pacific tracks between Renton and Snohomish for their Everett service. However, the bridge, trestle and tracks between Monroe and the Tualco Valley were extensively renovated as a spur line for hauling gravel from a rock quarry there but this usage never materialized and the line deteriorated into a state of abandonment. The track across Buck Island still exists and can be walked in Al Borlin Park on Buck Island, but the bridge was removed in August 2005 because the pylons at the south end were in danger of collapsing. I have a small steam locomotive and often pull passenger train at the Great Northern & Cascade Railway at Skykomish. 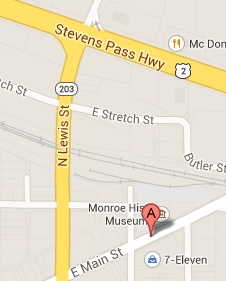 We are not quite clear on some of the original Milwaukee trackage in Monroe. The old maps show the Milwaukee crossing the GN just East of Woods Creek. Was this on a trestle and are there photographs of this? Easy to assume that the GN would object to a diamond. Also, the Milwaukee depot shows on the 1930s maps where Lewis St is now, which if so would suggest that it has been moves only a short distance to its present location. Is this correct? One more thing; was the Cherry Valley line an entirely separate track from the Milwaukee line, or is some or all of the existing Milwaukee grade the Cherry Valley line to Carnation?